This 96-page hardback introduces a new format from The History Press. 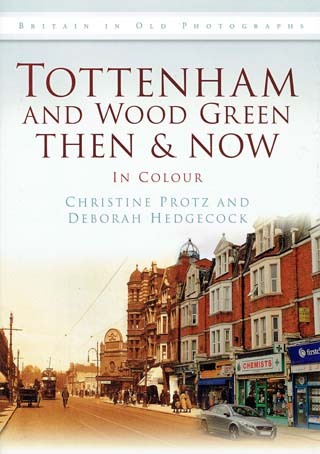 It presents an old view from the Bruce Castle Museum archive in sepia and a modern full colour view, by local photographer Henry Jacobs, of forty-two locations in Tottenham and Wood Green accompanied by informative text. Chris Protz is a long-time resident of Tottenham who has studied various aspects of local history. She is an active member of several local community groups including the Friends of Bruce Castle which she helped establish. Deborah Hedgecock has always had a strong interest in history and studied Classics at Cambridge University. She has been curator at Bruce Castle Museum, the local history museum and archive in Haringey, since 2002.